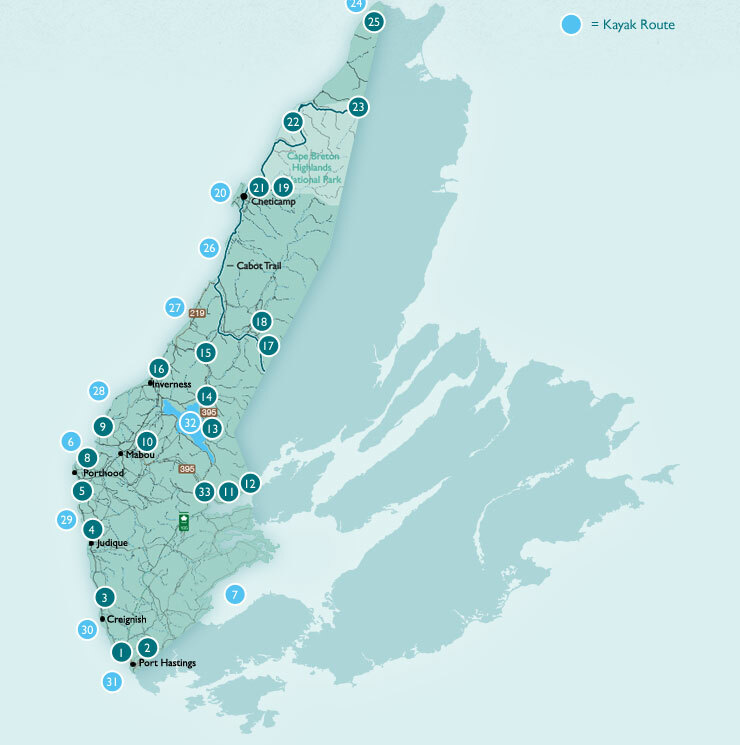 The Gypsum Mine Trail Project started in 2009 by the Chéticamp Economic Council (CEC) is work in progress but the association hopes to complete it this year. This 12 km multipurpose trail begins on the waterfront at the Chéticamp Quai Matthieu / Boardwalk and loops around a bog on the old railroad bed built in the early part of the century to mine the gypsum deposit at the base of the mountain in ‘Belle Marche’. ‘Belle Marche’ means Pleasant Walk and this is what this trail is. But that is not all. At the end of the trail you will find this beautiful lake which reminds the adventurer of a mini Lake Louise in Alberta. Once completed, picnic tables will be installed with a mountain bike circuit and a hiking trail around the perimeter of the lake. The Gypsum Mine Trails Project is part of a larger project to build a multipurpose trail around the Cabot Trail to link up to the International Appalachian Trail and the TransCanada Trail. The Gypsum Mine which operated from the early 1900 closed in 1939. 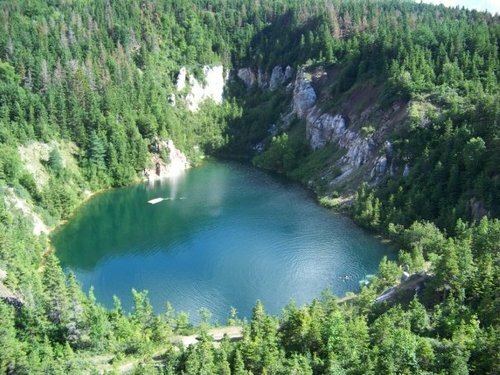 Today the open pit mine is a lake located at the base of the mountain overlooking the village of Chéticamp and is visited by locals and people from all over who have heard about it from word of mouth. Start at le Quai Matthieu and read up on the history of the gypsum mine on the various plaques installed. Then take your bike or hike in nature and history up to the gypsum mine quarry. Don’t forget to bring your lunch, your swimsuit and a plastic bag for your garbage. Le sentier de la mine de plâtre commencé en 2009 par le Conseil économique de Chéticamp (CEC) devrait être complété cette année. Ce sentier multi usage de 12 km, dont plus de la moitié est terminée, début au centre du village de la communauté acadienne de Chéticamp en sillonnant sur l’ancien chemin de fer construit au début du siècle pour terminer à l’ancienne carrière de gypse. Ce site enchanteur qui nous rappel un mini Lac Louise en Alberta à éblouie plus d’un visiteur comme mais aussi les gens de Chéticamp. Le sentier coupe la route de Belle Marche et vous comprendrez pourquoi le nom si vous décidez de vous y adonner. Une fois complété le site comprendra des tables de piquenique, un circuit pour vélo de montagne et un sentier de marche autour et surplombant le lac. Ce sentier fait partie d’un plus grand projet visant a construire un sentier multi usage autour du Cabot Trail et le faire raccorder au Sentier Transcanadien et le Sentier International des Appalaches. La mine de plâtre fut exploitée du début du siècle jusqu’en 1939. Aujourd’hui c’est un beau lac entouré de falaises de gypse, un site qui a charmé plus d’un randonneur. Le site est visité par des gens de partout. Ne manquez pas votre chance. Partez en bicyclette ou à pied à la découverte de la nature et de l’histoire de ce merveilleux coin. Stationné au Quai Mathieu /promenade au bord de l’eau au centre du village ou à Belle Marche et plongez vous dans l’histoire en lisant les plaques situées au Quai Mathieu. Et n’oubliez pas d’apporter votre lunch, votre maillot de bain et surtout un sac à poubelle pour ramener vos déchets. Inaugurated 28 May 2011, this new trail, whose name can be rendered in English as the Gypsum Mine Trail, connects the Quai Mathieu, in the heart of the village of Chéticamp, to Chéticamp Back Road and to the area between Belle-Marche and La Prairie containing the former gypsum mine that was in operation there between 1907 and World War II. The trail up to Chéticamp Back Road is of the same finished quality as the Trans-Canada Trail, with a fine sand tread astride a more solid base. Like the Trans-Canada Trail in Cape Breton, it is a multi-use trail suitable for bikes, ATV’s, and snowmobiles as well as for hikers. Its initial course parallels the Barren Road, mostly hidden by a thin line of trees, and then passing by an open field with views of the Cape Breton Highlands to the north. It then leaves Barren Road heading to the northeast and makes a large bend switching from northeast to east to southeast; most of this part of the trail is through woods. As it descends to Chéticamp Back Road, it exits the forest and provides fine open views of the Cape Breton Highlands to the east. Once the trail reaches Chéticamp Back Road, its subsequent course is not obvious. I walked up and down the road looking for a plausible continuation. Expecting to find a trail similar to the fine trail on which I had been hiking, I was perplexed: no signage is yet up to indicate where one is supposed to find the gypsum mine. As I was descending the trail to Chéticamp Back Road, I had noticed at the base of the mountains in the distance something that looked like a gypsum cliff face. So, I headed down a gravel road about 150 m/yd north of the trail I had left that my GPS showed led in the direction of the gypsum cliff face I had noticed. This road was in poor shape with lots of mud and water holes, but at least it was going in the right direction. Twenty minutes later, I had arrived at the base of the cliffs in what was clearly the area where the mine once was. Numerous roads left from the mining days criss-cross the mine area, in which one could spend a lot of time looking at the various formations on the cliff faces. There’s a road up a slag heap at the top of which one has enough height to get some wider open views. By the time I got there, I did not have a lot of spare time left, having to meet a friend for dinner and a Candlelight Tour at the Highland Village in Iona later in the afternoon, so I did not spend nearly as much time there as I would have liked. I will have to return again to the mine to do it proper justice. I assume the intent is to eventually transform the road from Chéticamp Back Road to the mine into a trail of the same quality as that between Chéticamp and Chéticamp Back Road (but have found nothing to confirm that assumption). It’s a fine hike with some excellent views. It’s mostly downhill on the hike out from Chéticamp, which I didn’t really notice until I found myself puffing pretty heavily on the return trip—nothing major like climbing a mountain, but a good work-out for an overweight and not-too-fit type like myself! Inverness County has a Unique Trail Experience for Every Weekend of Your Year!